In this article based on his new eBook, Heal and Protect: A Nuclear World, our Author of the Month for August, David Schumann, presents an overview of his seminal study on radioactivity, in the spirit of protecting ourselves and our environment against nuclear disasters. There are many ideas about global catastrophes and possibilities that exist: comet impacts, sea-rise, environmental destruction, super-volcanoes, and massive solar flares, even. We are aware that these mega-catastrophes could leave our fragile societies clinging for survival as our technology fails and massive disruptions and disasters disconnect us from the modern-day lifestyle we have grown accustomed to. Graham Hancock’s book Magicians of the Gods raises the real possibility of a future comet impact, which could devastate the human race. Like the great biblical flood told by nearly every culture across the globe, a few survivors make it to safe ground to start again, with their terrible stories slowly transforming into myths and tales. What if, however, when these troubled survivors begin to reestablish themselves, they are mysteriously sickened, mutated, and die early deaths? Instead of finding some place to begin again, they find a strange and invisible poison that they can’t rid themselves of or avoid. One of the greatest issues with our precarious nuclear reactors dotting the globe that very poorly protect us from their very hazardous wastes, is their need for external power. Their dependence on the centralized and inherently fragile electrical grids of the world should give us pause. Fukushima was an accident that resulted from the loss of power for days, even hours, but what happens when power is down for weeks, months, or longer following some great catastrophe? The greatest threat from Fukushima was not the active nuclear cores, but the spent-fuel piled up on the roof constantly being cooled by circulating water. The world now has more than 250,000 tons of nuclear spent-fuel stored poorly for the tests of time, human error, and Earth forces. Certain pollutants dissipate quickly relative to geological time-scales, but the radioactive pollution from our reactors and bombs lingers for thousands of years. Radioactive pollution contaminates all space and all time, and is able to cause disease, mutation, and death to the unlucky who unknowingly come into contact with these forms of radiation. Even without great catastrophes, we are constantly littering radioactive pollution across the globe. Fukushima and Chernobyl were the worst nuclear disasters we have experienced (and still are experiencing) but they’re far from worse-case scenarios. Nuclear reactors are always releasing radiation into the environment, and the legacy of our past haunts us. There will be more accidents. Modern militaries use radiation weapons indiscriminately without regard to their true consequences (depleted uranium), and the nuclear nations have been busy developing small, tactical nuclear weapons to use on the battlefield. Humanity is day by day choosing a radioactive future at our peril. Radiation is nothing more than energy that moves through space in some form. This energy is fundamental to the physical universe and our human experiences of it. Radiation is light, heat, and sound. We are surrounded every moment of our life with electromagnetic, particle, thermal, acoustic, and even gravitational radiation that we interact with constantly. Radiation can be as natural as the sun, or as unnatural as the radiation from a nuclear bomb blast. Mostly in the 20th century, humanity learned to utilize the broad spectrum of radiation for progressing technologies, especially in communication and energy. We learned to transmit electromagnetic (EM) radiation waves for broadcast television, radio, and mobile communications. We learned to split the atom (fission) and utilize atomic energy. Unleashing these nuclear forces allows us to destroy our world in the blink of an eye, drive massive ships around the sea for decades, power cities and nations, peer into the body (X-rays/CT), and save lives. We are enthralled by the power of nuclear forces, and today, some even hail nuclear energy as the solution to climate change. The unique properties of radioactive materials and the unparalleled energy density they open for us have bestowed electrical power, political power, healing power, and world-destroying power. They have also left a legacy of pollution and global contamination that threatens the health of our species. This is a part of the story I present in the book. It is this type of radiation resulting from our use of nuclear technology which is the main focus of my book, Heal and Protect: A Nuclear World. It details all sources of ionizing radiation, which are energetic enough to tear electrons from their orbits around atoms, but focuses particularly on the threat presented by anthropogenic radiation resulting from nuclear energy and weapons. This man-made radiation is extremely hazardous to our health and a hidden health threat for everyone. This threat is ignored and largely misunderstood because of the way in which we measure the radiation and compare it to other types of ionizing radiation, which are quite different. Governing and scientific committees establishing protection standards on ionizing radiation, such as the ICRP, NCRP, or BEIR, inadequately assess the exposure to internal radiation from man-made radioactive contamination. This error justifies the lax regulations concerning radioactive pollution. We can’t avoid these worst forms of radiation, because they are here to stay and we don’t yet have the wisdom or knowledge to prevent their release, but we can heal and protect from them while we wait. The uplifting message I convey in the text is that our bodies and beings are amazing and we can heal and protect if we are aware. If we help a little, we help a lot, and there are a lot of simple strategies we can employ to mitigate this threat. Diet, avoidance, detoxification, supplementation, and lifestyle strategies are provided so we can mitigate this health threat for ourselves, our families, and our descendants. These strategies to living with our radiation burden are the core of the book, but the larger context of why we should think differently about man-made radiation is presented. Ionizing radiation can’t be avoided, but most of the sources we encounter each day we should worry little about, like background radiation from the Earth and sky, and naturally occurring radioactive materials in our food and water. There are precautions we must take with some of the natural forms of ionizing radiation, such as radon; but the unnatural and new forms that result from splitting the atom give the worst effects. We must therefore be aware of the effects of ionizing radiation, and mitigate them sufficiently. Man-made radiation is different and unique because we split very large atoms of uranium, plutonium, or thorium into smaller atoms such as cesium, strontium, barium, or iodine. These new by-product radioactive isotopes have fundamentally different chemical and physical affinities and can therefore seep deeply into our tissues, cells, and even into cell nucleuses or DNA strands. These radioactive forms don’t exist in nature but when we forcibly split the nuclear fuels, these extremely radioactive isotopes emerge. They are millions and billions of times more radioactive than natural forms of radiation we have evolved with in our food, water, and air. Historically, we have blasted them across the globe in atomic bomb tests, but nuclear energy accidents and day-to-day operations are in many ways more hazardous. The book is not anti-nuclear, because nuclear technology is like any other technology: a step forward, but with consequences to be managed. The purpose of the book is to offer solutions to the health threat which is real, misunderstood, and still voraciously denied. For whatever reason, the prevailing scientific and governmental understanding, which is driving policies, does not recognize the threat for what it is. There is no doubt a touch of pragmatism, and perhaps denial here, as we have already littered our planet with radiation that affects us all from our foolish Cold War nuclear testing, but also from our poor nuclear reactor designs and wastes that we’re stuck with. We already have a very radioactive planet and we march continually towards more pollution and harm. For me, the importance of this topic can’t be underestimated. Ionizing radiation is both the nemesis and foundation of life because of its relationship with DNA. DNA and the body are adept at mitigating natural forms of ionizing radiation, but these newer, more radioactive forms are different in key ways. DNA codes everything in our body, from how to build a cell to how to power a cell. It is one of the great mysteries of the universe; it is the most complex molecule with the most complex and miraculous purpose of sustaining and evolving life. The fact that ionizing radiation is the greatest threat to DNA, causing mutation and cell death, means we need to be aware. We burden ourselves and our descendants with a terrible legacy that can mutate who we are and our ability to evolve and thrive as we are meant to. We are struggling with a fundamental error in how we measure exposures to radiation (dose measurements, and specifically effective dose calculations) of especially harmful radioactive isotopes that infiltrate our bodies. Demonstrating the error in the assumptions and logic that underlay the current methods for calculating and comparing internal radiation is a key focus of the book. A real health hazard for everyone is being ignored because we calculate internal doses incorrectly. This blind-spot permits the justification of lax and unacceptable regulations governing radioactive pollution and much misunderstanding, to the point where many are advancing the idea that small amounts of man-made pollution may be good for us! Too often we find the same arguments being used, even in the most prestigious scientific journals. These arguments compare cumulative background radiation doses to instantaneous medical radiation doses to internal doses from both naturally occurring and man-made radioisotopes inside our bodies. While ‘ionizing radiation’ is accurately named, there are many nuances to consider when concerning its health effects on humans, like whether the radiation is electromagnetic or particle-based, whether it comes from inside or outside, and whether it is penetrating or non-penetrating. We fall into the fallacy of confusing the word with the myriad phenomenon it attempts to describe. The distinction ultimately lies in how the energy is delivered to the cell. If the energy is diffuse and spread over large regions or over the entire body, the body is capable of repairing DNA and the damage to any individual DNA strand is minor. However, when internal radiation from highly radioactive particles is considered, we find the energy focused on just a few cells. These cells become the center of inflammation, the DNA is heavily damaged, and worse, DNA repair processes are constantly interrupted. The naturally occurring radiation we have evolved in is always diffused over the entire body in space and/or time. Background radiation, for example, has been calculated to hit every one of our 40 trillion cells once in a year. While that’s a lot of ‘hits,’ the body can easily repair the minor damage this causes and no single cell is stuck continuously. Likewise, naturally occurring Potassium-40, found as a certain percentage of all potassium, is perfectly distributed across the body, found in literally every cell, and is extremely weakly radioactive, so that the hits are again nearly perfectly diffused. The body can deal with this. Internal radiation from highly radioactive isotopes (and certain types of medical radiation) are shown to be very different. They are heavily concentrated on small regions or just a few cells. These cells become the center of inflammation, the DNA is heavily damaged, and worse, DNA repair processes are constantly interrupted. This is where the distinction lies, but the scientific committees (ICRP, NCRP, BEIR) ignore this nuance in their calculations, which means the magnitude of these exposures is shrunk excessively so that they appear to be harmless. 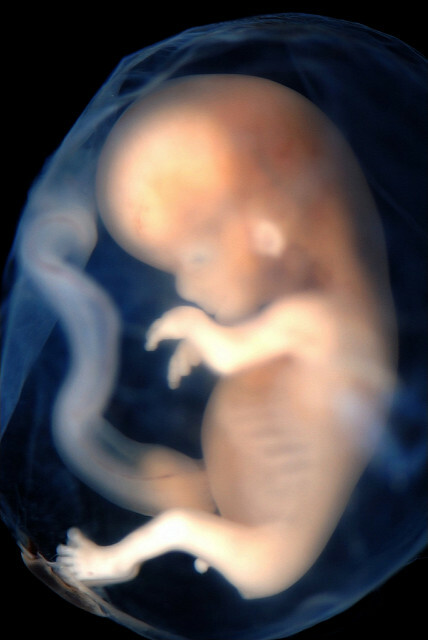 We pass this world and our genes onto future generations. The passion illuminating this book is centered on healing and protecting these gifts so that we can thrive and evolve as we are meant to. Ionizing radiation is a great threat to our world because of how long the contamination persists, and how destructive it is to living systems. It also presents the greatest threat to our genes, which are the very essence of who we are and the way in which we grow and evolve. This means that radiation may threaten our descendants more than it threatens ourselves. It’s the uniqueness of the threat that drew pen to paper and called me to write this book. 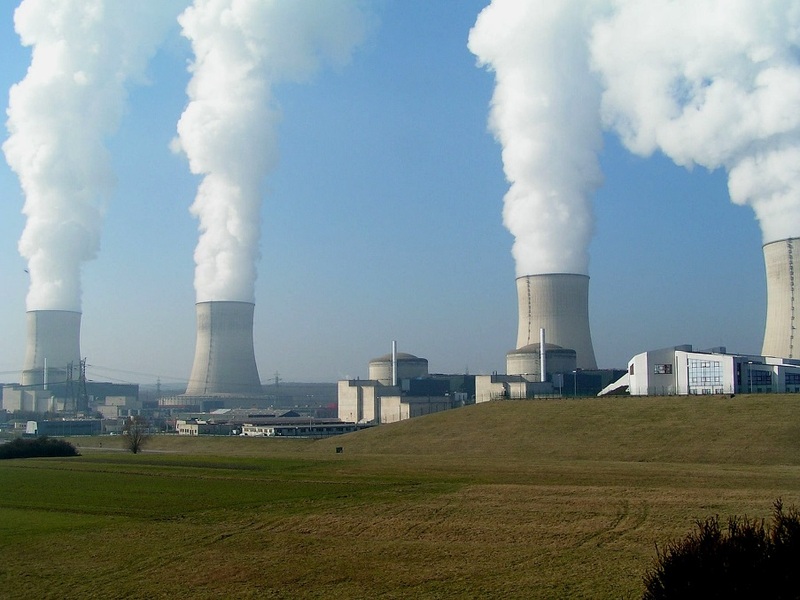 It’s the fact that nuclear pollution can become much worse if we’re not careful. In a generation, with the right vision and collective will, we could solve murder, malaria, and poor air. It will take many more generations, however, to solve the issues that arise from nuclear technology, waste, and pollution. The fact that this threat can mutate our very genes and change who we are is frightening, to say the least. More frightening is that we don’t understand all of the ways in which it can happen. Most people want to think about gross mutations, but the subtle mutations that cause genetic predisposition to disease, auto-immune disorders, lower intelligence, and reduced vitality are more likely and more worrisome. These are at the base of the iceberg, unseen, and yet we are still focused on the visible tip, blind to the peril that could lay below the surface. Another frightening aspect to fully understanding the risk that radiation poses is to understand the Nobel Prize winning studies conducted by Herman Joseph Muller on fruit flies. These studies showed that it can take up to twenty generations before genetic mutations manifest from radiation. This means that diseases like cystic fibrosis, diabetes, or any of the other six thousand known diseases that are genetically inherited, can take some time to appear. Considering how much anthropogenic radiation has been released historically, and in such a short space of time, we have cause for significant concern. None of the radiological protection standards take this into account, nor do scientists yet understand all of the intricacies of genetic mutation, transmission of mutations, and how mutations can affect the health of our children. The health and radiation debate is stuck focusing on cancer and attributable deaths. The question is always ‘how many additional cancers?’ or ‘how many additional directly correlated deaths?’ Ionizing radiation, especially the unique man-made forms of it, can directly cause cancer or death, or contribute to it, while it also craftily contaminates our food, air, and water. There is no denying the cancer epidemic that started in the second half of the 20th century and continues raging at the beginning of the 21st. It has become commonplace that children and young adults get cancer. This is a global trend that affects us all. How much could nuclear pollution have factored into this? We don’t really know. Ionizing radiation definitely plays a part and yet we don’t know how much influence it has in shaping our health destinies. In a sense, there is no control group that can serve as a baseline because we all have radioactive particles from nuclear testing and accidents in our bodies. 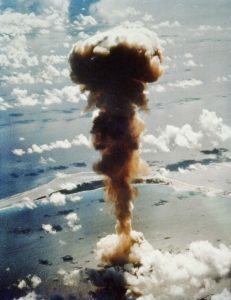 Even the much lauded atomic bomb survivors study has been critiqued because the control group used in it arrived on the scene after the blast (Hiroshima), but still ate contaminated food and water, like the rest, taking in internal radioisotopes that affected their health and skewed the control group badly. Cancer is the most lagging indicator one could pick. It would be like a business choosing bankruptcy as the metric they track. If a business goes bankrupt, it’s never caused by a single factor, but by many, sometimes synergistic factors. The same is true with cancer. The leading indicators we need to be watching are cell function and more subtle chromosomal aberrations, somatic mutations, and heritable mutations. Cancer takes decades to demonstrate correlations and the small percentages we can prove are radiation resultant seem almost insignificant compared to the remaining causes. What is more likely to occur: mutations that lead solidly to cancer, or mutations that lead to other more subtle, and difficult to detect diseases? What about damaged genes for our children? How can we know? Vitality and the level of health we experience are never measured or included in this debate, and yet it can be said easily that these are the most important factors when determining our quality of life. Everybody dies from something, but not everybody really lives in an abundant state of fullness, health, and real vitality! The current system looks at a very black and white evaluation of the risks between ‘sick’ and ‘healthy.’ It doesn’t care about the quality of our life experience. 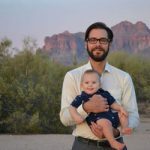 It doesn’t see the real burden that nuclear pollution has on our entire body, combined with other draining influences, to reduce our vitality, energy, speed of recovery, and the innate resilience of our incredible body. ‘Sick’ means you are one of the few percentages that succumbed to cancer from your exposure to radiation. ‘Healthy’ essentially means ‘alive with no evidence of disease.’ This tendency to categorize misses the nuances of the level of your vitality; what other diseases and ageing processes you’re at risk from, and the extent to which you’re really ‘healthy.’ It’s the quality of your health which allows you more freedom – to experience life to its full potential. We care about the statistics too much. We proclaim success because we seem to be living a little longer, but the cost of this success is a monstrous health-care debt, which is unsustainable. Instead of people dying, they can live longer, but with serious necessary medical intervention and suffering from a host of pathologies in staggering numbers, like Alzheimer’s, dementia, diabetes, depression, hypertension, and the flitting back and forth between cancer remission and progression. Radiation has been shown to contribute to most of these diseases, so how much has it contributed already? Heal and Protect: A Nuclear World is not about public policy where some committee has to decide that one additional death in a thousand or in ten-thousand is worth the price. 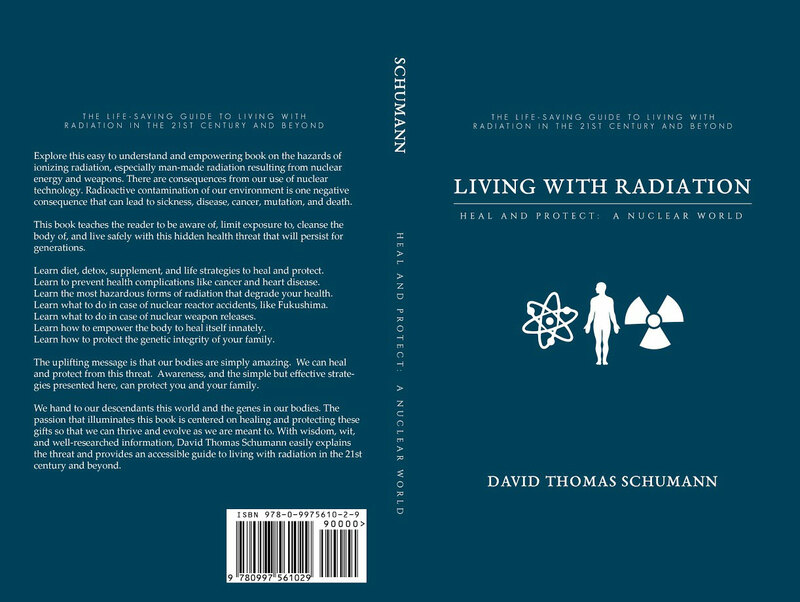 The book is about each person who confronts radiation each day. Each person has their own right, if they choose, to a life free of hidden health threats that deny them the vitality and health they deserve. Every person must be aware then and acquire the knowledge to protect themselves, because those we place our trust in have done a poor job of protecting our health. Nuclear energy has promise and it is not my purpose to argue against it (that’s for another book), but to rather highlight the consequences that are real and affecting us because of it. There are difficult choices we must make regarding energy policy. Nobody will deny that we need energy and more of it, but we need to be honest about the consequences of our decisions so we can adequately protect against them. As the world becomes more contaminated with radiation, either slowly with constant discharges or quickly with more accidents, the protection standards allow higher levels of radiation. History has already shown this to be true. The issue with how internal radiation is measured incorrectly and downplayed will take decades to correct because of the way science and government are inherently slow to admit error and correct course. To admit that internal radiation of anthropogenic origin is far more hazardous than first assumed would be to admit the need to reform the entire nuclear industry and redouble our efforts to deal with the legacy of nuclear waste and storage. Most governments have an amazingly difficult time performing the most basic functions, like agreeing on a budget or key ideological issues. Their propensity is to kick the can. No governments in the world but a few are looking seriously at what to do with all of the waste that is piling up, and with the ageing fleet of reactors. Companies, on the other hand, are required by law to make profit their number one priority, and so it is. Nuclear war, which just a decade ago seemed a remote possibility, now seems more likely than ever. The world powers continue their geopolitical games with continued proliferation of nuclear weapons. The major nuclear powers have all developed small, tactical, nuclear weapons for use on the battlefield. Nuclear non-proliferation isn’t seriously pursued by governments anymore and Cold War mentalities, rhetoric, and policies seem to be returning. We are digressing. Polarization, conflict and chaos in the world continue to worsen. Terrorism, proxy wars, economic recessions, food crises, and regional conflicts in Eastern Europe, the Middle East, Asia, and Africa are creating more opportunities for tragedy and are facilitating wrongful use of nuclear energy, especially depleted uranium weapons. We must be vigilant and remember our pledge to progress and to end this era of nuclear weapons. There is no place for radiation weapons in the 21st century. This has to be the standard. We know too well the risks of irresponsible use. The global peace movement which sprung up nearly three-quarters of a century ago did so in response to this terrible threat of nuclear apocalypse. We must be vigilant. We also must be aware so we can protect our communities. Beyond all of this chaos and cause for concern, however, is the rising crescendo of a new voice which whispers peace, prosperity, and real progress. The body is incredible in its capacity for healing, growth, and vitality. The body, like our global community, has an inherent organizing, building, repairing, and evolving constancy which can overcome any obstacle, even nuclear pollution and containment. I wrote Heal and Protect: A Nuclear World to foster awareness of the risks of man-made radiation. I wrote it for each person who wants to live a life of real health and vitality. I wanted it to be uplifting and empowering so that we resist the temptation to become defeated, and instead realize that we have power over our bodies and over our world. Healing always starts with empowerment and is sustained by nurturing. For the most part, I wrote Heal and Protect: A Nuclear World for our descendants — in the spirit of leaving our world and our genes in a better state than how we inherited them. It is simple: 1.Get rid of right-wing fascist extremists in politics. 2. Worship the Mother Earth Goddess, if not in her anthropomorphic form, at least in her principles of caring, cooperation, solidarity, and holistic visión. One World for the Good of All. 3. Realize that Democratic Socialism is the political system most in harmony with the Real Self of each person, and most in harmony and hope for our future survival and prosperity.